Rooms with Colour Cable Television, Attached bathroom, 24 hrs Hot Water, Telephone, Work Desk, Cafetaria, Internet Service. 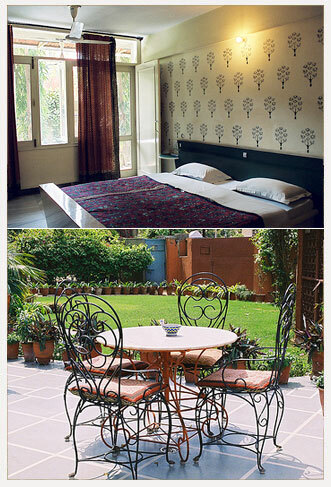 This Property is a family-run establishment started in 1976 by a retired Wing Commander of the Indian Air Force, is located in the heart of the Pink City, Jaipur. This Property has a garden ambiance, roof-top lounge/ restaurant and spacious rooms that gives guest the relaxed atmosphere they require when retreating from the Indian heat. Furthermore, This Property is centrally located near all major points of interest and arrival/ departure, though we remain tucked away from all the busy thoroughfares, allowing for a restful sleep. Cafetaria at This Property serve Indian as well as Continental snacks, Breakfast, Lunch and Dinner. Naturally they do special catering for groups with specific requirements. Perhaps the Inn's most dramatic offering is the Roof-Top, which commands an outstanding panoramic view of the Jaipur City, including Nahargarh Fort. They also serve a Buffet Dinner every night. Other Amenities & Services include: Front Desk, Room Service, Bus-Parking, Post, Laundry, Travel Desk, In-Room Telephone Service, Wake up service, Luggage Storage.